The latest Exquisite Corpse mapping project is complete. 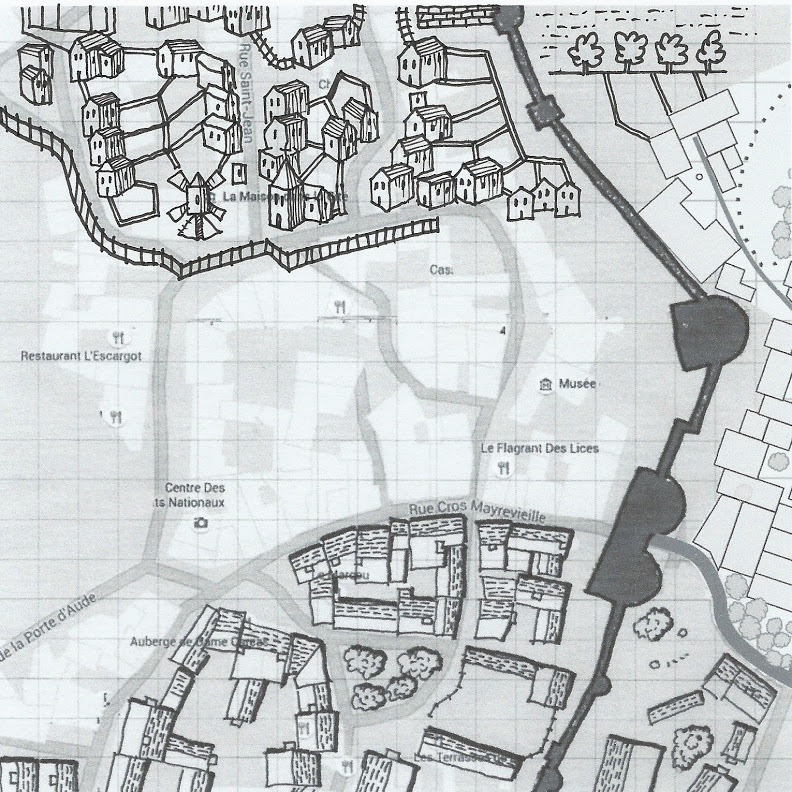 Exquisite Corpse 3 is a collaborative fantasy city map with works by a dozen map-making artists included. The JPG doesn’t do it justice; you really need to get the PDF (link at the bottom) and zoom in enough to see the detail and scroll through to get a sense of what this is. Contributors to this Exquisite Corpse include: Christopher Weeks, Rodger Thorm, Ivan Katyurgin, Paul Baldowski, Kevin Campbell, Andrey Makarov, Nate Marcel, Ed Allen, Christian Kessler, Jim Magnusson, Scott Aleric, and Gennifer Bone. My gratitude for their combined contributions, which made this project possible. The process was more involved than the previous Exquisite Corpse dungeons. Here, contributors saw the adjacent sections, but only drew part of the section they were assigned; the next contributor filled things in in order to try to keep from having such sharply delineated edges between sections. Sometimes it worked better than others. LINK: ExquisiteCorpse3-CITY-final-ArchC701 (PDF) This is sized for a C-size (18″ x 24″) architectural sheet (and is 70% of the actual size in order to fit on the page). This will also fit onto an 8-1/2″ x 11″ sheet fairly well, but you may not get all the detail. EDIT: Updated version released with corrected section of map and revised and enlarged text to make authors names easier to read. There are a couple hours between when you have to arrive at the park in order to have a parking spot and when the community fireworks program actually starts. So this was a pre-4th of July fireworks* dungeon. I’d grabbed this old but unused notebook to bring along, a fat Paperchase gridded notebook with hundreds of thin pages in it. It’s probably A5 size (roughly 5.5″ x 8.5″), and it’s so fat the spine is curved, rather than straight. There are probably 400+ pages in a notebook that’s over an inch thick. So, this could be the first of many, many maps (and other notes). The grid is fairly close on the pages in this notebook. The grid that I drew into the map is actually every 2 squares. To make the map, I just laid out an assortment of rooms across the page, and then connected them together. I wanted a really tangled, haphazard looking layout, and that seems to be what I ended up with. I took some pictures along the way to show the process. 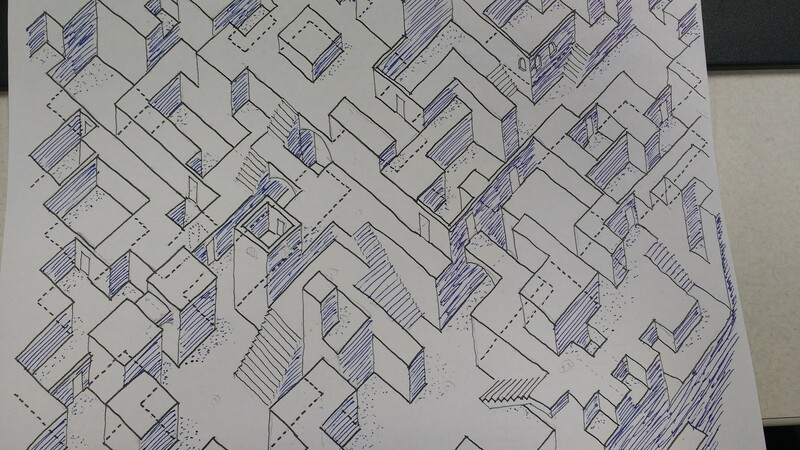 I only had one pen with me, so this was all done with a simple medium Flair pen (except the gridding, which was added in with a thinner Micron after we got home). After a wonderful partial map posted by Kevin Campbell a couple weeks ago [here on Google+], I did some looking and found a couple blank map forms*. They aren’t wonderful quality (too dark and heavy), but they’ll still do for doodling. Circles and spirals were obviously what was behind this map. And, it seems there was maybe something in the water, since Matt Jackson also posted a very circle-y map earlier this week, as well. This was still in process at the time, but I shared an in-process version, just for comparison. The latest couple maps have been exploring the idea of interrupting a long, continuous hallway; in this case, the arcing diagonal hall is broken with a large circle, and various smaller halls and rooms spin off from the various paths. This is a little bit out of sequence, but I think last week was supposed to be the next post, so things got messed up anyhow. So, enjoy this one, and there will be a new one next week to get back on schedule. This city map from an old DragonQuest campaign recently turned up during some sorting. It was a preliminary sketch, and far from completely worked out. A few key locations are identified, and some general notes about other areas are pencilled in. The Castle sits atop a rocky hill, commanding the highest ground in the area, and two lower hills and the intervening valleys make up the terrain occupied by the city. Wider, longer hachures are to indicate hills, and the shorter, tighter ones are more cliff-like. Two large bridges have been built to span the valleys and connect other parts of the city to the center. Gafton is a city with a population of around 24,000 located in a high plains/mountain foothills setting (think of someplace sort of like Denver CO). It is one of a number of city-states in the region. There are rivalries and alliances between these city-states which keep the area politically turbulent. Populations tend to cluster more than typical because the outlying areas are very wild and hazardous to travel through. Dangerous beasts and great monsters are prevalent, as well as the numerous mercenary companies who cross the region in service to the princes of the cities. Experimenting with some alternative textures for the cavern walls and a bit more interesting layout with the bridge and stairways in the Sand Cavern. 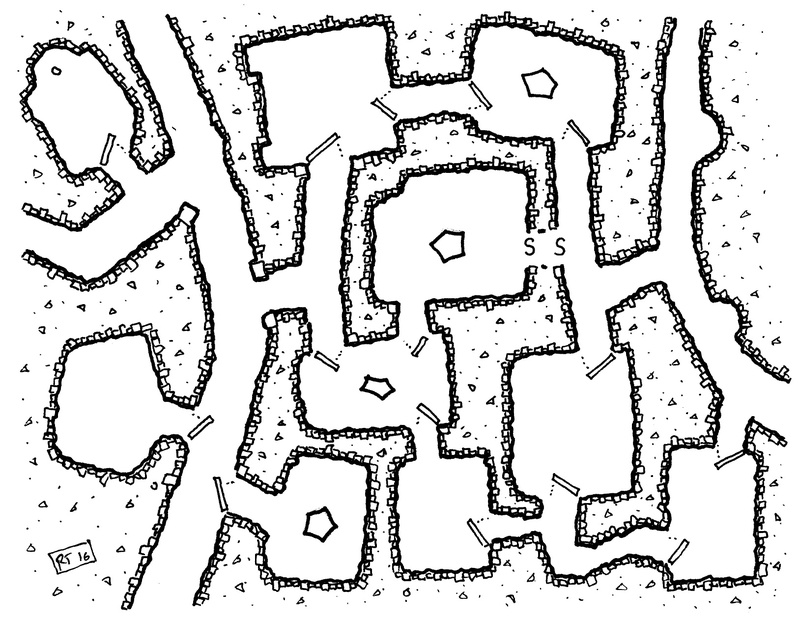 This is a bit more constrained in the ways the two passages are connected, with the Sand Cavern being the nexus to get from one passage to the other (unless you locate the secret passage connecting the two side rooms). The rooms are almost all subsidiary to the passages, rather than being interconnected in the way some other Intersections have been. This is mostly done now. There are a few final touches that need to be added in, and the upper layers haven’t been drawn, yet. But this gives a pretty good sense of where I’m headed with this project. I thought the idea was pretty great, although mostly just a throwaway, initially. But I’ve spent too much time fussing over it, and I think it’s lost some of the original energy. There is already a section above this, which is well underway, with the surface and the actual bridge itself. By implication, there could be a couple more sections, with the two ends of the bridge off to either side. There are also at least two more implied underground sections, with the tunnel leading off to the right and the stairway leading even deeper. Those may remain unknown, though. Too many things I don’t like in this, although it was fun to try. Intersection F is less “intersectiony” than a couple of the previous ones, a little more of a knot, with intertwining ways to get from one side to another. But still, it has the same general organizing idea of an area where several paths off in different directions are interconnected. This does not have stairs or anything to graphically represent a level change, but it feels to me as though the right side should be higher than the left, and maybe some of the hallways would actually be ramped downward to accommodate the level change. Well, obviously, the character of the walls was the thing for this one. At first, I thought it was going to have several states to it, like old etchings. This is the “second state” (the earlier being just a general poche for the solid areas without any particular density close to the walls. But, it seems done, and I don’t feel compelled to mess with it more at this point, so I’m calling it done. 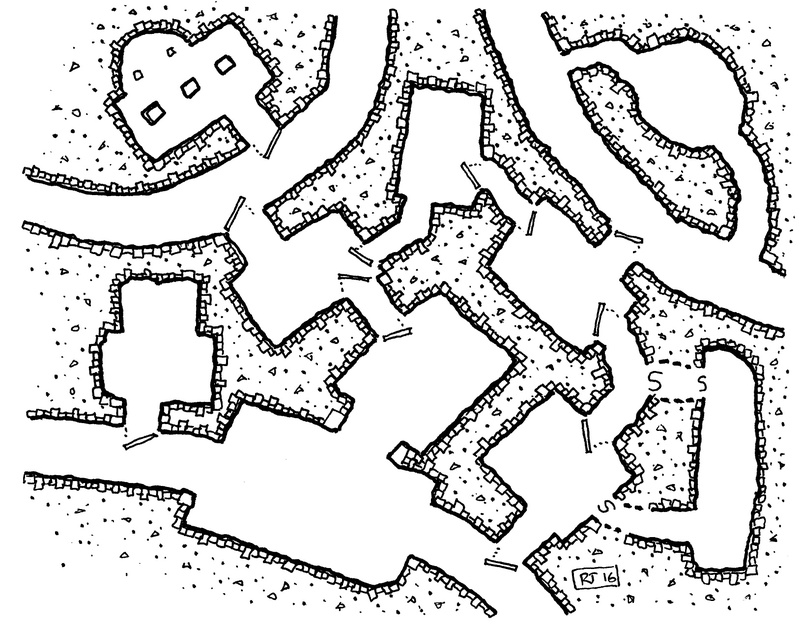 This particular map has several entrance points, which seems entirely appropriate for its wandering, sprawling style. The character of the walls suggests nibbling or biting out pieces to clear the openings. It could also work as a series of islands in a wet swamp. As is the case with most of my maps, feel free to use this for any non-commercial purpose (with attribution), or contact me if you’d like to use this on a commercial project. This is Intersection E from the intersections series. Originally the idea for these was that they would be really quick maps (the first couple were only about an hour each to draw), and I’d post one a week, although I’m behind on that count. But, if the Intersections are a year-long project, and I’m giving them letter names, then that would imply about one every other week, and I’m ahead of schedule in that case. This set of passages comes to a common meeting chamber almost like wires to a chip. There are four connections (one off each edge of the page), and the other two doors from the central meeting area just lead to simple rooms. The initial idea for Intersection D was to make it a nexus between three different pairs of passageways. These could be three different underground systems, or just a common meeting area within a single, larger complex. The ritual nature of the central meeting area suggests a possibility of it being a common meeting point for the three areas, where some sort of group activity might be carried out. The nearby chambers off each set of paths could serve as waiting areas for members of each of the different regional factions, and the side chambers of the meeting nexus itself (leading off from the central room to the lower left) might be for some group purpose at these gatherings. 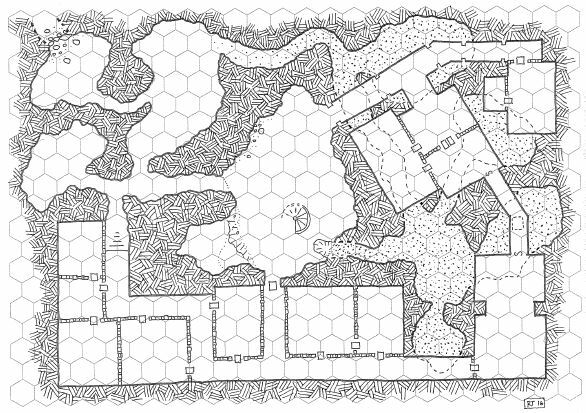 This is another in the current series of smaller maps for connecting dungeons or staging encounters.